The Avett Brothers were on Jimmy Fallon last night, and I've got to say, they rocked it out! This is one of their new songs, and while definitely a departure from their typical bluegrass styles, I love it! it's not where I am, it's who I'm with. I've been listening to A LOT of Avett Brothers these days. Between painting the kitchen and the road trip to Phoenix, they've been playing pretty much playing nonstop on my ipod. Here they are performing one of my favorites, "St. Joseph's," live from a gondola in Jackson Hole, Wyoming. Beautiful. I really love that sentiment: It's not where I am, it's who I'm with. PS. Phoenix hit 119 degrees today. Yes, it really is that hot. And, yes, I do realize that some people live here all the time. I know I've mentioned them before, but have you checked out The Avett Brothers yet? They're my favorite band all around and have just been signed by Columbia Records! I'm sure they feel like they're dreams are coming true. One of the things I love about these guys is the beauty in their songs, the poetry in their lyrics. Wow! How true is that? Why is it that as we grow up, we're supposed to stop having fun? Everything's so serious, so "grown-up." Can we bring back the joy? Can we start laughing? Out loud? A lot? No, really, all the time. How often do you laugh out loud? Try to do it more. Make laughter a priority, a goal of living. Cultivate laughter and joy in your life. Surround yourself with people who make you laugh. And then realize what happens when you welcome such delights into your life. And then spend some time with the Avett Brothers. They won't disappoint. 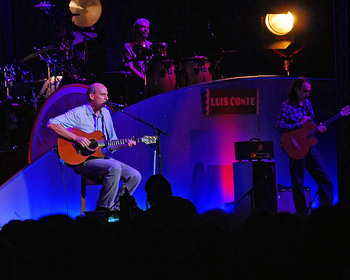 On Sunday, I went with my mom to see James Taylor at the Greek Theater on UC Berkeley's campus. What an amazing venue to see such an incredible artist! It was such a wonderful evening: sitting outside, watching the sun set over the bay, and listening to James Taylor all night. I really do think that would be an awesome way to start out each day. Another thing I discovered on Sunday is that James Taylor is funny. Seriously, laugh out loud funny! I would highly recommend seeing him if you get the chance. He seems so peaceful and really at peace with himself. As an artist, he's had struggles in his life. Public struggles. And, yet, he still keeps playing and putting himself out there. That takes an amazing amount of courage. PS. Two of the songs he performed made me cry. 10 points to whomever can first correctly guess both songs in the comments below. PPS. Yes, I know I'm a total sap who cries at concerts! Your point? *I know that the actual line is "Sweet dreams and flying machines." But I always thought it was "finer things," and really, doesn't that have a nice ring to it? Take my hand. We'll make it, I swear. I like Bon Jovi. A lot. Not like "President of his Official Fan Club" a lot, but "I go see him every year in concert and dance my booty off" a lot. My mom got tickets to their show a few years ago, and I reluctantly went as her date. What a surprise for me to find out that, um, Bon Jovi rocks! They have become one of my favorite acts to see live. Maybe third overall, after Prince and the Avett Brothers. Now my mom and I go see them live every time they're in town. They are fantastic performers and have a really incredible energy. It's really fun people-watching too! 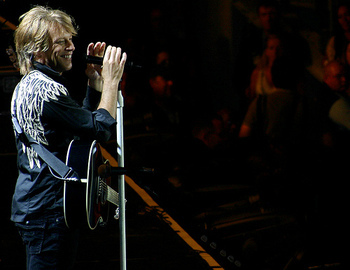 Pick the Brain had a post today that listed Invaluable Life Lessons from Bon Jovi. I thought this was definitely worth sharing, not just because I'm a Bon Jovi fan. All of this advice is fantastic, and many of the points are things I've been thinking about almost daily as I contemplate changes that I want to make in my life. I was especially drawn to Point #4: Miracles happen everyday, change your perception of what a miracle is and you’ll see them all around you. I've been thinking about this a lot lately, how our perception of certain things can shape our experiences. I've also been trying to become aware of the influences other people have over my own thought patterns, both positive and negative. I think that gaining awareness on this can really help show you how both your own perceptions and other people really do affect how you think about things. There are people in my life that bring me down. These are people who seem to always have drama and aren't content with how things are. When I'm around these people, it's easy for me to fall into their patterns and negative thinking. Alternately,there are certain people in my life who I feel drawn to because of their positive energy, who seem to energize me just with their company. I crave these people and feel so full when I spend time with them. Almost surprisingly so. It's refreshing, really, and I feel so fortunate to have such wonderful influences in my life. Awareness is the first step. Be aware of how you think about things, how you interpret your experiences. Be aware of how your perceptions affect your mood and your thoughts. Be aware of how you feel when you're around certain people. How do they influence your mood? Do they bring you down, or do they seem to lift you up? It is only once you realize how your perceptions affect you that you'll be able to make active, deliberate changes in your thinking. And, it's amazing how those deliberate changes in your thinking can change so many things about your life. Alison Krauss is my new pretend girlfriend. Sorry Kate Winslet. We saw her perform last night at the Greek Theatre in Berkeley with Robert Plant. Wow! What an amazing show! She really had the voice of an angel. I really enjoyed Rising Sand, the album they put out last year. But, I was blown away by how amazing the performance was last night. If you have an opportunity to see them live, I would highly recommend it. In the meantime, definitely check out Rising Sand. It's so well worth it.